This is the first time I prepared authentic, Kerala style Varutharacha sambar (Thrissur recipe). People call this as Onam sadya sambar. I have already tried Kerala ulli sambar and Varutharacha sambar recipe without coconut for my onam sadya menu earlier. Yesterday I made this thenga aracha sambar for our lunch following this recipe. The smell of roasted spices along with coconut takes this sambar to the next level. 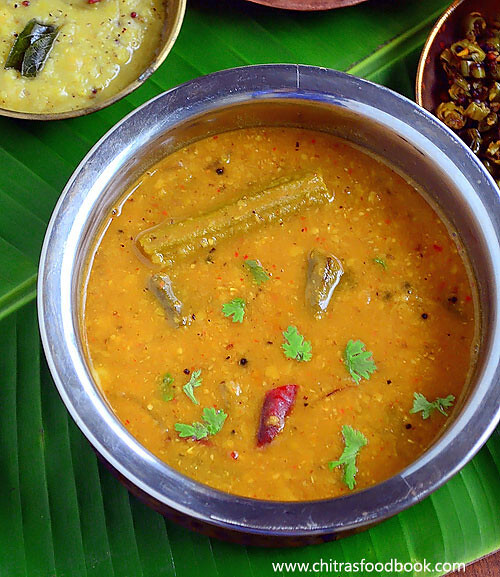 The nice aroma of this sambar while cooking will surely tempt you to have the food quickly.Its a must try sambar recipe for Onam festival. But it needs a resting time of at least 30 minutes for all its flavor to blend well. I have used drumstick/muringa, onion/ulli and ladies finger/vendakkai. For variations, you can also use carrot, potato and even bottle gourd ( Kumbalanga in Malayalam). This sambar can also be made using sambar powder and roasted coconut. I will share that version later. The ingredients used in this recipe is very similar to our Tamilnadu style Arachuvitta sambar except the quantity of coconut. Recently I tasted Onam sadya lunch menu in Kumarakom restaurant in HSR layout. It was a simple ona sadya yet tasted delicious. I loved their sambar, moru curry and sambaram the most. This sambar tasted close to the one I had in restaurant. Friends, do try this Kerala type sambar recipe for your lunch. I am sure you will make it more often. Lets see how to make Kerala Varutharacha sambar recipe with step by step photos. 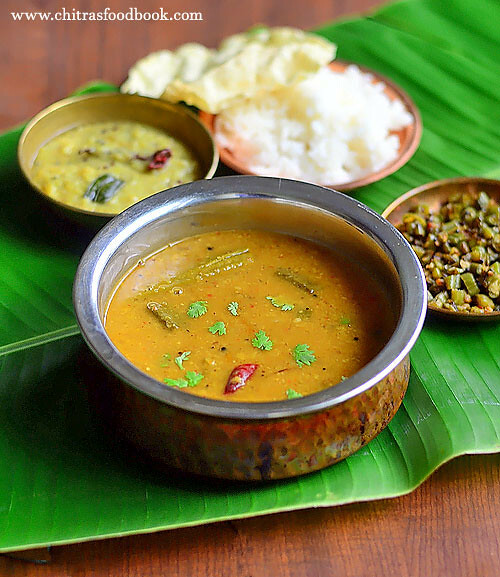 Check out my Kerala Ulli Sambar recipe and Varutharacha sambar without coconut if interested ! Soak tamarind in 1/2 cup warm water for 15 minutes and take the extract. In the mean time, pressure cook toor dal adding required water, turmeric powder and few drops of oil. Chop drumstick into finger size and keep it in a small bowl inside pressure cooker. Do not add water in drumstick. It will get cooked with the help of steam inside cooker.Cook for 2 whistles in low flame. Open the cooker and mash the dal well and set aside. Keep the cooked drumstick separately. In a kadai, heat coconut oil and saute all the ingredients given under “ To saute & grind”. Saute till you get nice aroma.Do not burn any of the ingredients. Let them cool down. Grind everything to a smooth paste adding required water. Set aside. In the same kadai, heat coconut oil and splutter mustard seeds, urad dal, red chilli and curry leaves. Add chopped ladies finger and onion, saute till turns transparent. Add this to the cooked dal, tamarind extract, ground coconut paste and cooked drumstick pieces. Check for taste and add more salt if needed. Let the sambar roll boil for few minutes. Nice aroma wafts through. Garnish with coriander leaves and give a boil. Switch off the flame and cover it with a lid. Give a standing time of 30 minutes before serving. Enjoy mixing with plain rice. Add few drops of ghee while serving ! You can also add chopped carrot, potato. Add them to the drumstick in a separate bowl and cook inside the cooker. Adding tomato is optional. I din’t use it. Add red chillies as per your taste. 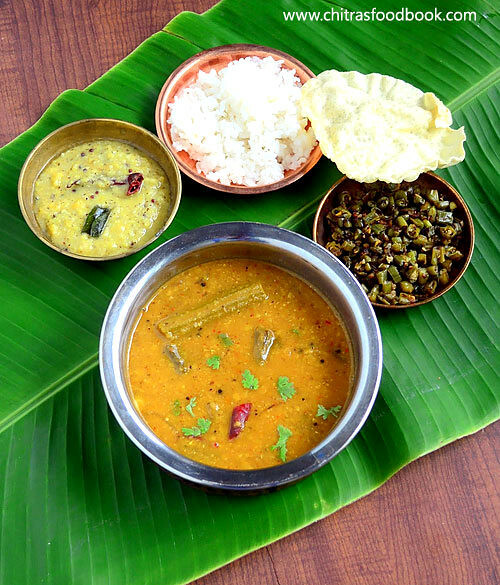 Delicious Kerala sambar is ready to serve with rice. I served it along with Kerala parippu curry and beans mezhukkupuratti. It tasted yum !